Lorraine Nawa Jones was born in New Zealand and her studies commenced in London at Morely College and the Trinity College of Music. A Major County Award enabled her to study in Italy, her home for over thirty years, and later in New York. In 1972 she debuted as a leading soprano with the Israel National Opera, singing for the first time such exacting roles as Desdemona, Nedda and Mimi. The critical reviews remarked on her natural ability to interpret vastly differing protagonists, combined with a innate musicality and warm lyrical voice. On returning to Rome, Lorraine Nawa Jones was discovered by Napoleone Annovazzi, one of Italy’s leading conductors and was quickly signed to sing Margarita in Faust, Liu in Turandot, Euridice in Gluck’s Orfeo and Elvira in Rossini’s L’Italiana in Algieri with the Dublin Grand Opera. Further studies with Italy’s great mezzo-soprano Gianna Pederzini led her to win the Rome Opera House auditions and she was consequently offered the leading role in Thais with Renato Bruson, the Te Deum by Bruckner and concerts at Rome’s prestigious Accademia di Santa Cecilia followed. Richard Bonynge directed Lorraine Nawa Jones at the Rome Opera House in Lucrezia Borgia. A very enthusiastic Richard Bonynge offered Jones the possibility to sing with the Australian National Opera. She debuted with the company in La Bohème singing Mimi under the baton of Carlo Felice Cillario. She was chosen to sing Aida with Canberra Opera participating in the “Historic Telecast” the first live simulcast of opera in Australia with Marenzi, Show and Elkins. Her subsequent interpretation of Butterfly conducted by Torben Petersen won both audience and critical acclaim. 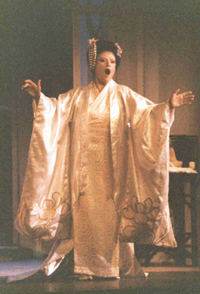 Lorraine Nawa Jones was greatly influenced by her contact with Tito Gobbi, who took a keen personal interest in developing her singing and interpretation of Trovatore, I Masnadieri, La Boheme, Anna Bolena. Her natural affinity with Donizetti’s dramatic heroines enabled Jones to sing and interpret such difficult roles as Elizabetta in Roberto Devereaux, Lucia di Lammermoor and Lucrezia Borgia, La Traviata, Tosca and Mozart’s Requiem in Rome enlarged her varied repertoire. She was asked to sing the soprano role in Verdi’s Requiem with Marenzi in Paris. Umberto Borso was her Otello in Ankara Turkey with Bruno Aprea conducting. Desdemona to Marenzi’s Otello, followed in Italy. New Zealand’s T.V3 filmed Jones’ prestigious Quantas Award winning “Diva” documentary directed by Julienne Stretton in Rome. The interest stimulated nation-wide resulted in a series of orchestral concerts “Home from Rome” at Auckland’s Aotea Centre, where she and her husband Angelo Marenzi and conductor Sergio Oliva delighted enthusiastic audiences. Concert tours in Taiwan, Italy, Israel, Ireland, Singapore, Malaysia, U.S.A, Canada, Germany, England and frequent appearances on TV and radio complete her busy schedule. The great passion that she feels for singing and acting is transmitted to her students through her teaching at various music Conservatories in Italy and master classes in Europe and Asia. Together with Angelo Marenzi, Lorraine Nawa Jones was voice teacher at the “National Institute of the Arts” in Taipei (Taiwan), where she has performed in concert, TV and with the National Orchestra and the Taipei Symphony Orchestra. Angelo Marenzi and Lorraine Nawa Jones have been Artistic Director of Cosmos Opera, a group dedicated to the development and promotion of Taiwanese vocal talent. They collaborate with M.Th.I. on lyric opera training and artistic projects.